CLICK HERE to listen to episode audio (4:05). All Web addresses mentioned were functional as of 5-26-17. From the Cumberland Gap to the Atlantic Ocean, this is Virginia Water Radio for the week of May 29, 2017. This week, music by a Nelson County- and Charlottesville, Va.-based band, vividly reminds us that water has great power, but also complete indifference, over human concerns. Have a listen for about 35 seconds. That stark image underlines what’s at stake in the annual National Safe Boating Week, which in 2017 ran from May 20-26. For that event, the National Safe Boating Council, the U.S. Coast Guard, the National Weather Service, and many other partners increase their efforts to educate boaters on how to stay safe on the water. This year the Safe Boating Council and the Weather Service have a safety lesson for each day of Safe Boating Week, covering these seven topics: distress-signal equipment, marine forecasts, life jackets, boating under the influence, fire extinguishers, thunderstorm safety, and hurricane preparedness. In Virginia, getting that kind of boating information is the law for motorized boat operators: completion of a boating-safety course is required for personal water craft operators aged 14 or over, and for all operators of motorized boats of 10 horsepower of more. As of 2015, Virginia had over 230,000 registered motor boats, along with thousands of canoes, sailboats, and other non-motorized boats. If you plan to be in one of these vessels—whether on foamy, flat, or flowing water—please make sure that you know how to have a safe voyage: be prepared, be sensible, and wear a life jacket! "Dirty Sea” and “Wandering Boots” are copyright by Chamomile and Whiskey and by County Wide Records, used with permission of Chamomile and Whiskey. More information about Chamomile and Whiskey is available online at http://www.chamomileandwhiskey.com/, and information about Charlottesville-based County Wide Records is available online at http://countywidemusic.worldsecuresystems.com/. This episode is a revised repeat Episode 214, 5-19-14, for Safe Boating Week 2014; that episode has been archived. Take a little quiz on this week's episode: In which situation shown below are boating safety and a life jacket necessary? 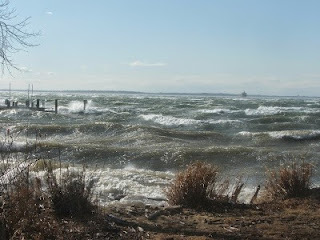 High winds and waves on the Chesapeake Bay, looking south from Kent Island, Md., February 25, 2011. 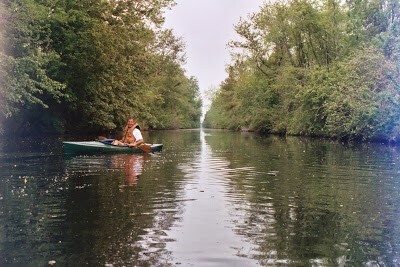 Kayaker on flat but deep water in a Dismal Swamp canal, April, 30, 2005. The answer, of course: all three! Following are links to the seven safe boating public service announcements (audio, video, or text) for each day of National Safe Boating Week 2017 from the National Safe Boating Council and the National Weather Service, online at http://www.nws.noaa.gov/os/marine/safeboating/week.shtml. National Association of State Boating Law Administrators, “Operation Dry Water” Web site, http://www.operationdrywater.org/. See particularly “ODW Campaign,” online at http://www.operationdrywater.org/content.asp?admin=Y&contentid=139. National Safe Boating Council, online at http://www.safeboatingcouncil.org/. Information on Safe Boating Week is online at http://www.safeboatingcampaign.com/. U.S. Coast Guard, Boating Safety Division Web site, http://www.uscgboating.org/. The Coast Guard’s annual reports on boating statistics are available online at https://www.uscgboating.org/statistics/accident_statistics.php. The “2015 Boating Recreational Statistics” report is online (as PDF) at https://www.uscgboating.org/library/accident-statistics/Recreational-Boating-Statistics-2015.pdf; Table 38 includes number of registered boats and incidents by state (234,052 registered boats in Virginia in 2015; motorboats only). 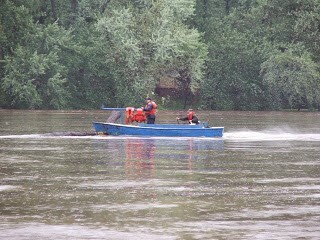 The Coast Guard’s mobile application for safe boating is online at http://www.uscg.mil/mobile/. Virginia Department of Game and Inland Fisheries (VDGIF), “Boating,” online at http://www.dgif.virginia.gov/boating/; and “Boating Safety Education Requirement,” online at http://www.dgif.virginia.gov/boating/education/requirement/. VDGIF’s “2015 Recreational Boating Incident Summary” is online (as PDF) at https://www.dgif.virginia.gov/wp-content/uploads/2015-boating-incident-report.pdf. The main phone number for VDGIF’s central office in Richmond is (804) 367-1000; contact information for local VDGIF offices is available online at http://www.dgif.virginia.gov/about/offices/. Virginia Marine Resources Commission/Virginia Marine Police, “Boating Safety,” online at http://www.mrc.virginia.gov/MP/boating_safety.shtm. National Weather Service/National Safe Boating Council, “Boating Safety Tips and Resources, available online at http://www.nws.noaa.gov/os/marine/safeboating/. All Water Radio episodes are listed by category at the Index link above (http://www.virginiawaterradio.org/p/index.html). See particularly the “Recreation” subject category. Episode 270, 6-15-15, on Operation Dry Water and boating under the influence.